Committees establish intersessional working group to prepare guidance on PIC POPs chemicals. The first joint meeting of the Chemical Review Committee and the POPs Review Committee took place in Rome on 20 October 2013, attended by 75 participants. The Committee exchanged information on their respective mandates and review processes, and discussed ways to strengthen scientific synergies and enhance collaboration and cooperation among the committees. The committees established a joint intersessional working group to develop guidance to assist parties to the Rotterdam Convention and the Chemical Review Committee in their work when a chemical under consideration is a POP listed under the Stockholm Convention. 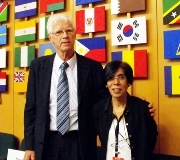 The intersessional working group will be co-chaired by Ms. Mirijam Seng (Germany) and Mr. Azhari Abdelbagi (Sudan). The report of the meeting is available from the joint meeting page.